Breathable, comfy 4 way stretch cotton-spandex fabric is perfect for year round use. Contoured fit eliminates bagging. Flattering Lo-Rise cut provides excellent comfort and freedom of movement. Adjustable drawstring waist. Elastic gripper ankles provides secure fit. synthetic micro-suede knee patches for excellent grip in the saddle. No bulky seam on the inner leg. Reinforced seams. Machine wash-easy care. Perfect for growing little riders who are tough on their clothes. The 4 way stretch micro-poly-spandex fabric provides excellent stretch and recovery. Built to last. Easy care machine washable makes it easy on mom. Dev-tek moisture control helps keep your little rider cool and dry. Reinforced seams and belt loops. Heavy duty YKK zipper and brass snaps. Synthetic micro-suede knee patches ensure a steady grip in the saddle. Gripper elastic ankles keep the leg secure in tall boots or paddock shoes. No inside leg seams to rub or chaff the legs. Plush elastic waistband provides a comfy and secure fit. All-Pro Hipster cut breech made with our popular German style ribbed fabric with Dev-Tek moisture wick finish that helps keep you cool while you ride. Plush elastic waistband, synthetic micro-suede gripper knee patches for excellent control. Flattering hip-hugger style. Elastic ankle grippers keep the leg from riding up with tall boots. Reinforced seams. No inside leg seams for maximum comfort. Contoured fit eliminates bagging behind the knee. Machine washable. A fully functional and comfortable Men's riding breech. Made with 95% cotton-5% spandex lycra for excellent stretch and recovery. Contoured fit eliminates bagging behind the knees and seat. Plush elastic waistband helps keep shirt tucked in. Synthetic micro-suede knee patches for excellent grip in the saddle. Reinforced seams. No inside leg seam eliminates discomfort with boots. Heavy duty YKK brass zipper and snaps. Two functional outside pockets. Machine washable. Perfect for schooling or show ring. All-Pro German style ribbed fabric has 4 way stretch and provides excellent support and recovery. Made with Devon-Aire's exclusive Dev-Tek moisture wick finish to help maintain a cool and comfortable body temperature. Classic Fit cut provides a traditional look and comfortable fit. Contoured cut is form flattering and comfortable by eliminating bagginess. Plush elastic woven waistband. Reinforced seams and belt loops. Heavy duty YKK brass front zipper and snaps. Elimination of an inside leg seam means no rubbing or chaffing while wearing tall boots. Slant front zippered pocket. Microfiber suede knee patches. Elastic ankle panels eliminate bulky velcro strips with elegant piped trim. Easy care, machine washable. Ladies sizes 24- 34 Reg. & Long. 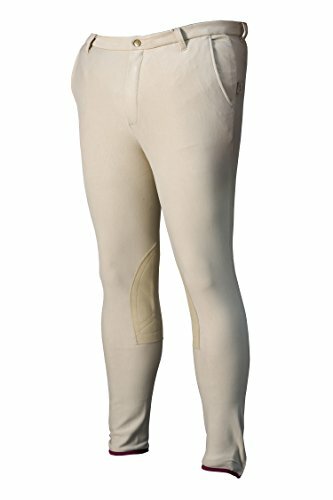 Devon-Aire(R) Ladies' Versailles Lo-Rise Breeches 4-way stretch Cotton/Lycra(R) blend fabric has excellent stretch and recovery with 10% lycra. Mid weight is perfect for year round use. Lo-Rise cut sits about two inches below the naval for a comfortable and fashionable look. Contoured fit to eliminate bagging in the seat and legs. Clarino knee patches, plush elastic waistband, brass zipper, reinforced seams and belt loops. No inside leg seam for comfort in the saddle. Features: Mid-Weight Fabric Lo-Rise No Inseam Clarino knee patches Plush elastic waistband Brass zipper Reinforced seams and belt loops Machine washable Item Specifications: Sizes : XSmall (20 - 22) Small (24 - 26) Medium (28 - 30) Large (32 - 34) XLarge (36 - 38) Material: 90% Cotton, 10% Lycra For a more relaxed fit, order one size larger. 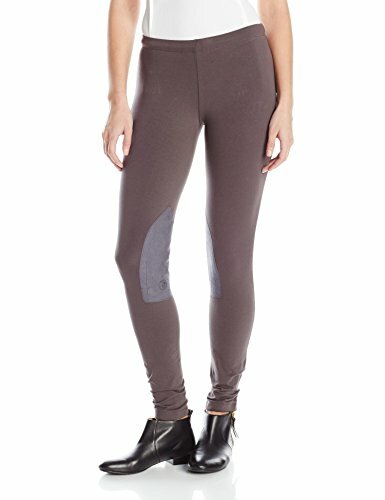 Import ** This breech is transitioning to a newer design including an elastic panel instead of the hook and loop closure at the bottom. 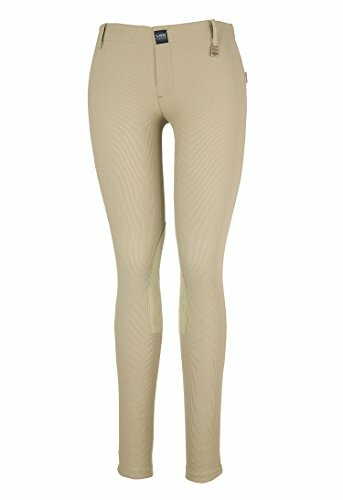 Devon-Aire Signature woven show breech provides excellent stretch and support. European refined tailoring and attention to detail. Mid-Rise cut fits comfortably. Contoured legs and seat eliminates bagginess. Wide waistband accommodates wider stylish belts. Reinforced seams and belt loops. Euro seat. Clarino synthetic micro-suede knee patches. Elastic ankle panels eliminates velcro. No inside leg seam for comfort with tall boots. Heavy duty double front snaps. Front pockets. Elegant contrast color piping on waistband and pockets. Provides tummy support and control. Cotton-Spandex 4 way stretch medium weight pull on breech. Perfect for year round use. Fully adjustable drawcord waistband. Contoured fit pattern in a Lo-Rise fit eliminates bagging in the seat and legs for a comfortable fit in the saddle. Elastic gripper ankles keep the leg in place with tall boots or paddock shoes. Faux fly front and reinforced belt loops allow for a classic show look. Reinforced self fabric knee patch. Perfect for everyday schooling and riding. Economical and durable. Machine washable. Ladies S- 22-24; M-26-28; L-30-32; XL- 34-36. Cotton-Spandex 4 way stretch moisture wicking fabric. Attractive heather finish. Flattering form fitting design. Plush elastic woven waistband similar to those found in expensive European brands. Contoured fit pattern in a Hip hugger fit eliminates bagging in the seat and legs for a comfortable fit in the saddle. Elastic gripper ankles help keep the leg secure with paddock boots or tall boots while in the saddle. Reinforced micro fiber suede knee patches. Part of the Devon-Aire X-Wear line of performance riding apparel. Machine washable. Ladies size XS-20-22; S-24-26; M- 28-30; L- 32-34. 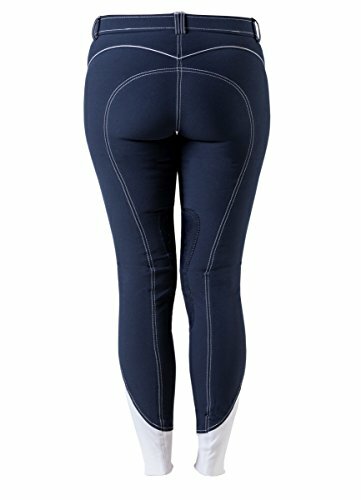 Looking for more Devon Aire Riding Breeches similar ideas? Try to explore these searches: Concealed Cabinet Hinge Full Overlay, Ktm Fuel Tank, and Buell Carbon Fiber. Shopwion.com is the smartest way for comparison shopping: compare prices from most trusted leading online stores for best Devon Aire Riding Breeches, Red Bins, Vessel Hammered Copper Sink, Riding Devon Breeches Aire . 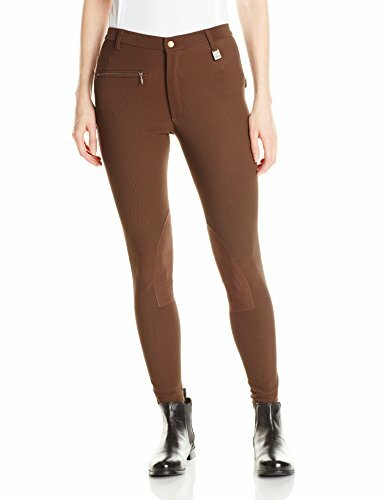 Don't miss this Devon Aire Riding Breeches today, April 19, 2019 deals, updated daily.